Hey tent glampers! Looking for that next step to make your campsite look spectacular? Keep your tent, but change the rain fly. You can make your own (as I did here) or have someone make one for you. I won’t lie, making a rain fly isn’t the easiest project. You either have to make your pattern first, for a fitted fly, or drape and tack, for a rain fly that is closer to a tarp. However, the style advantages may be worth it to you. You can pick your own fabric or even paint your rain fly. Just be sure to choose a material such as canvas, silk, or tent grade nylon and seal it well. Really, really well. 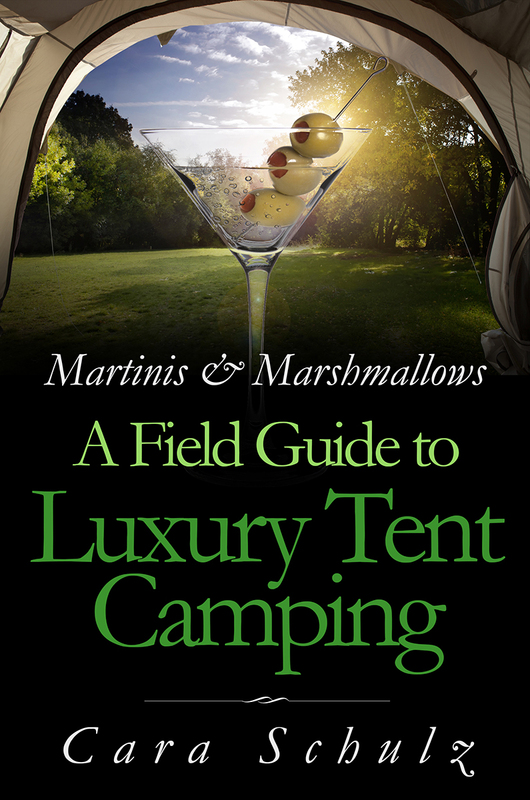 I’ve included the tutorial for a fitted DIY rain fly in my book, Martinis & Marshmallows: A Field Guide to Luxury Tent Camping. Above you can see the standard rain fly for my tent vs the new one I made. The old rain fly isn’t not bad, just kind of blah. I love my new rain fly. So much more cheerful. I love waking up and seeing those colorful squares making beautiful patterns on my white comforter. It was a bit of a pain to make and I’ve had to make some adjustments to it (and spray it with another layer of sealer) but it makes me happy just thinking about it. Plus, everyone knows which tent is yours. If you want an easier rain fly to make, consider making one that is more like a tarp. Really lovely ones have been made from shabby chic style sheets and held in place by using alligator clips and rope. Similar to the photo below, but with something far more attractive than a plastic tarp. 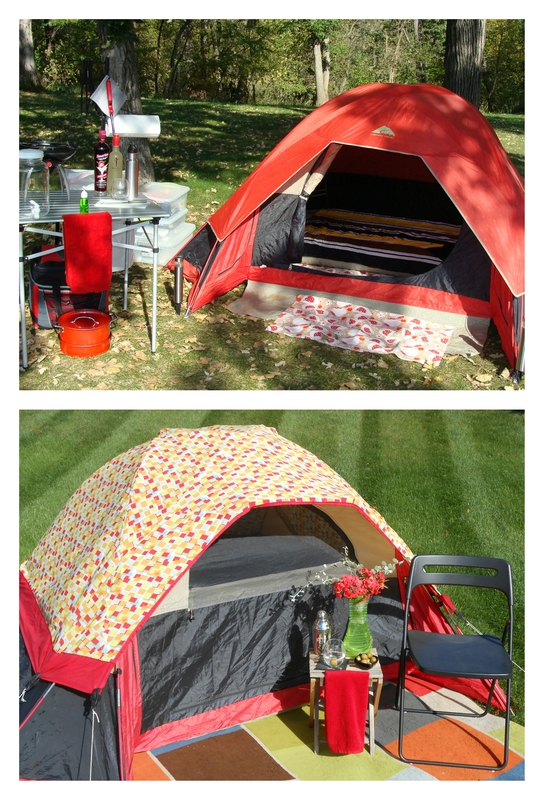 Below is an example of what you can do to a tent with paint. These are fairytale/SCA style tents, but I’ve seen rain flys painted to look like the Death Star or a garden. So what do you think? Would you paint your tent or rain fly? Or make a custom rain fly? Let know if you have already done this or are planning to do so for your next camping trip. Oh, and I’d love to see photos! Oooh… great off season project! Can’t wait to get the book! I know! Even though I have a new rain fly, I’m considering painting my 10 x 12 canopy I use for my kitchen/dining area when I camp. I DID make a canopy! It is fabric, lace, and vintage aluminum poles. I need to make something for me tent to match now! It’s cottage chic -ish.